This is a scalable context timeline. It contains events related to the event May 27-29, 2009: Conservative Columnist: Supreme Court Nominee Should Change Pronounciation of Her Name for Better ‘Assimilation’. You can narrow or broaden the context of this timeline by adjusting the zoom level. The lower the scale, the more relevant the items on average will be, while the higher the scale, the less relevant the items, on average, will be. New Republic legal correspondent Jeffrey Rosen, a law professor at George Washington University, writes an analysis of appeals court judge Sonia Sotomayor, considered by many to be a leading candidate to replace retiring Justice David Souter on the Supreme Court. Rose from Poverty to Consideration for High Court - Rosen gives a brief biographical sketch of Sotomayor, whom he labels as a “compelling” candidate both for her legal accomplishments and her life story. 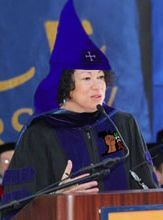 Sotomayor is the daughter of poor Puerto Rican immigrants, grew up in the South Bronx, and graduated with high academic honors from Princeton and Yale. She has served as a prosecutor, a corporate litigator, and a judge. 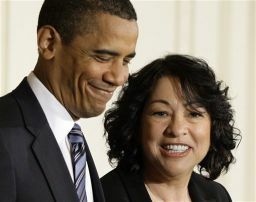 If nominated and confirmed, Sotomayor would be the Court’s first Hispanic member and only its third female member. She has the support of both New York senators, Democrats Charles Schumer and Kirsten Gillibrand. Repercussions of Analysis - Rosen’s column triggers several demeaning characterizations of Sotomayor in the conservative press (see May 4, 2009 and May 5, 2009), characterizations that will intensify when she is nominated for the Court (see May 26, 2009). His use of anonymous sources to base his negative coverage will be repudiated by a number of critics (see May 5, 2009). Columnist Marc Ambinder joins in the wave of conservative criticism against prospective Supreme Court nominee Sonia Sotomayor (see May 4, 2009) triggered by an analysis in the New Republic (see May 4, 2009). Ambinder warns the Obama administration not to choose Sotomayor simply because some liberals and Hispanics want her on the bench, calls her “solid if unspectacular,” and writes, “And the respectable intellectual center… is beginning to have doubts.” Ambinder does not note who, exactly, makes up the “intellectual center” he cites. [Atlantic Monthly, 5/5/2009] Nation columnist Chris Hayes retorts: “One gossipy article from Jeff Rosen means ‘the respectable intellectual center… is beginning to have doubts.’ Really?” [Salon, 5/5/2009] Less than a month later, Sotomayor will be nominated to the Court (see May 26, 2009). Republican National Committee chairman Michael Steele, guest-hosting William Bennett’s radio show, says that Republicans should not attack Supreme Court nominee Sonia Sotomayor (see May 26, 2009) over her race (see May 26, 2009, May 26, 2009, May 27, 2009, May 28, 2009, May 28, 2009, and May 28, 2009). Doing so risks damaging the Republican Party’s image, he says. Steele, who is an African-American, warns that the “liberal media,” and particularly MSNBC, will use the racially motivated attacks to paint Republicans as bigots. 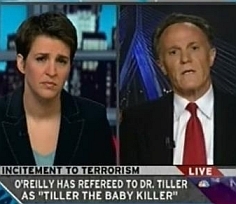 “MSNBC will rip everything we have to say up into shreds,” he says. “I’m excited that a Hispanic woman is in this position,” he says. Republicans should stop “slammin’ and rammin’” on Sotomayor, and instead “acknowledge” the “historic aspect” of the pick and make a “cogent, articulate argument” against her for purely substantive reasons. Steele says the party doesn’t want to “get painted as a party that’s against the first Hispanic woman” picked for the Supreme Court. Democrats have made similar attacks on conservative candidates in the past, Steele avers, and says that the “liberal media” gave Democrats an unfair advantage in such controversies. Steele does not mention two of the loudest voices in the racially-based attacks against Sotomayor, former House Speaker Newt Gingrich and conservative radio host Rush Limbaugh. Washington Post columnist Greg Sargent writes: “It’s a reminder of Steele’s predicament: He knows how badly these attacks are damaging the party and how neatly they play into the hands of Dems, but he can’t call out the leading figures launching those attacks, because that risks infuriating the base and feeding the meme that the GOP is hopelessly divided.” [Plum Line, 5/29/2009] Two weeks before, while hosting Bennett’s show, Steele had attacked Sotomayor’s intellect and personality, calling her “not a bell ringer” and “abrasive.” [Think Progress, 5/29/2009] A week later, while hosting Bennett’s show, Steele will say, “God help you if you’re a white male coming before her bench” (see June 5, 2009). Former First Lady Laura Bush says some positive things about Supreme Court nominee Sonia Sotomayor (see May 26, 2009). On ABC’s Good Morning America, Bush says: “I think she sounds like a very interesting and good nominee.… As a woman, I’m proud there might be another woman on the Court. So we’ll see what happens, but I wish her well.” [Think Progress, 6/8/2009] Bush’s comments stand in contrast to some conservatives’ gender-based attacks on Sotomayor (see May 26, 2009, May 28, 2009, and June 5, 2009).